Do you remember the story your grandmother narrated about Bhima defeating a man-eating demon – Hidimba? Chitradurg is supposed to be the location where that battle took place! Well among other battles, of course. The history of this town of Southern Karnataka traces back to 3rd Millennium BC. It’s been ruled and built in stages by the Mauryans, Rashtrakutas, Chalukyas and finally the Nayakas. It was during the time of Nayakas when the legend of Onake Obavva single handedly fought with Haider Ali’s troops. The final additions to the forts are from the time of Tipu Sultan. 120 kilometers from Hampi and 200 kilometers from Bangalore, Chitradurga lies amidst the valleys of Vedavathi River, surrounded by scattered boulders and standing on some of the oldest rock formations of India, Chitradurga is accessible via buses from surrounding towns and can be reached by driving through NH4. Nearest railheads are Davanagera and Chikjaj Junctions. 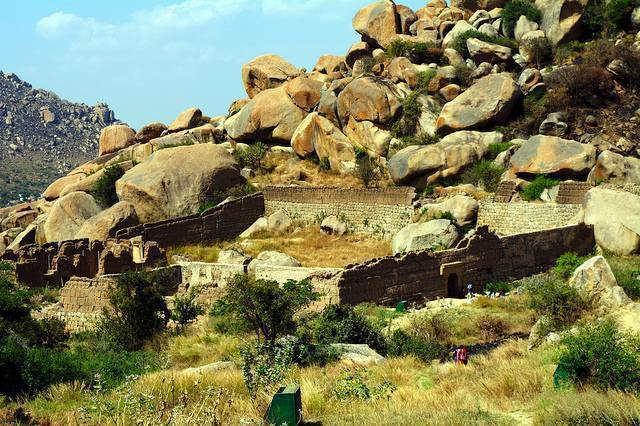 Chitradurga particularly means “Picture” (Chitra) and “Fort (Durg). If the legends of larger humans during the ancient years are true, the town looks like a Giant’s playground with boulders all over thrown like tantrums. The best time to visit this UNESCO World Heritage Site is in the months from October to March. A lot like its neighbor Hampi, it is a place for Monument lover who enjoys an ancient aura.